This post originally appeared in Wine Tourist Magazine. 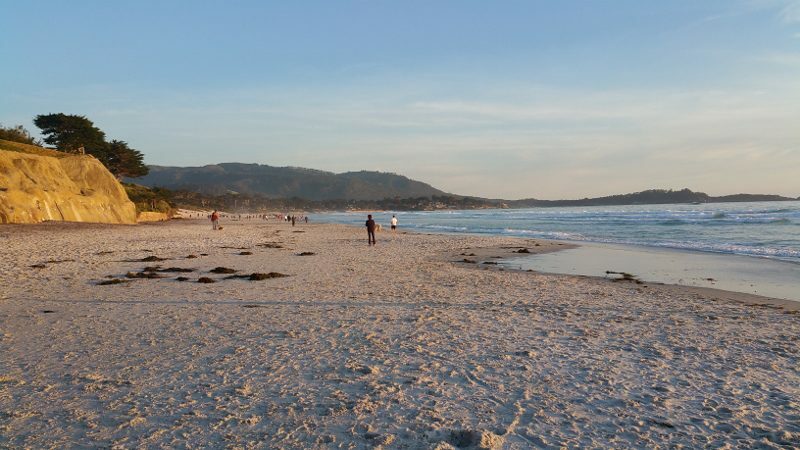 Whether looking for a romantic getaway or a weekend with friends, Carmel-by-the-Sea is that seaside town that offers charm, comfort and, of course, wine. Located on the south side of the Monterey Peninsula, Carmel-by-the-Sea (also called Carmel), feels like a town straight out of a storybook. It is a quaint town with buildings that are a mix of Swiss Alpine chalets and English cottages. This one-square-mile village, with no parking meters or street lights, is packed with restaurants, galleries, boutiques and wine tasting rooms. Grapes are grown throughout the Monterey area, from north of Monterey Bay to the southern border with Paso Robles. Although the area is diverse, the entire area benefits from the ocean breezes and fog from the chilly waters of Monterey Bay. Most of the winegrowing takes place in the ninety-mile-long Salinas Valley, which includes the AVAs of Monterey, Arroyo Seco, San Bernabe, San Lucas and Hames Valley. Santa Lucia Highlands, Chalone, San Antonio Valley and Carmel Valley are the four AVAs outside of Salinas Valley but are also part of the Monterey AVA. There are more than one hundred and seventy-five vineyards in Monterey Wine Country which means that there are a lot of wineries and tasting rooms to visit. Luckily, there are more than eighteen tasting rooms just within the town of Carmel. If you are staying in Carmel-by-the-Sea in one of the charming little hotels, these tasting rooms are all accessible by foot. Our base for the weekend was the delightful Tally Ho Inn. A boutique hotel that will make you feel like you are in the English countryside, Tally Ho Inn is a block from the center of Carmel-by-the-Sea and a couple blocks from the beach. Head out for a self-guiding wine tour with the Carmel Wine Walk by-the-Sea Wine Tasting Passport. For just $65 (and valued at $90), you will receive a $10 wine tasting flight at each of nine tasting rooms in the area. Caraccioli Cellars – A family-owned winery, Caraccioli Cellars focuses on pinot noir and chardonnay in their one hundred and twenty-three acres. With winemaker Michel Salgues, formerly at sparkling house Roederer Estate in Anderson Valley, Caraccioli Cellars is the only Monterey producer of sparkling wine and only one out of ten wineries in the United States to have its own sparkling wine equipment. Figge Cellars – Figge Cellars is owned by Peter Figge who is the vineyard guy, the winemaker and the sales and marketing guy. But, we caught him at the tasting room on our visit. Working as a vineyard manager since college in 1994, Figge got his Masters in Viticulture at Davis in 1995 and started Figge Cellars in 2004. Figge Cellars focuses on single vineyard designated wines from hand-selected local vineyards in Monterey to produce chardonnay, pinot noir, syrah, and rose. Wrath Wines – Wrath Wines was started in 2007 by co-owner and wine director Michael Thomas, an archeologist and the Director for the Center for the Study of Ancient Italy at University of Texas at Austin. With a passion for soil, as an archeologist, Thomas also has a passion for the soil of the Santa Lucia Highland where his sustainable estate San Saba Vineyard is located. Wrath produces pinot noir, chardonnay, syrah and sauvignon blanc with a focus on site specificity. 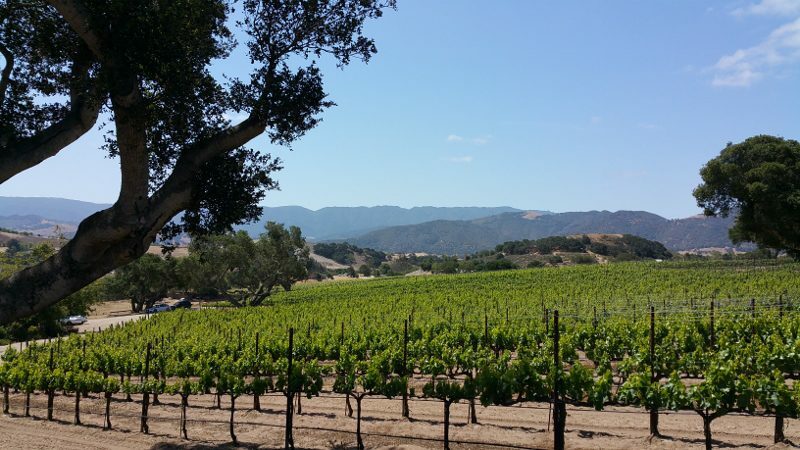 Silvestri – Silvestri Vineyards is located on twelve acres in Carmel Valley. With family ties to Piedmont Italy, Silvestri produces barbera, as well as chardonnay, pinot noir, syrah, pinot gris and pinot blanc. The winery is owned by Alan Silvestri who is better known for scoring some of the most iconic films in Hollywood history, such as The Bodyguard, The Abyss, The Avengers, Night at the Museum, Who Framed Roger Rabbit? and many, many more. A visit to the tasting room not only includes tasting the wine, but also listening to many of the familiar songs that Silvestri has written. Manzoni Cellars – Manzoni Cellars is owned by Sabrina and Mark Manzoni and Mark’s brother Mike Manzoni. Third generation row crop farmers, they grew rootstock that they sold to nurseries but initially had no intention to be a commercial winery. Then in 1999 they planted imported clones and two years later, the two barrels of wine they made came in second in a blind tasting. Today they are a small production family winery producing pinot gris, chardonnay, pinot noir, syrah and zinfandel. We only made it to five tasting rooms on our weekend but the best part is that the passport does not expire. You can use it all in one day or spread it out over a weekend, several weeks or even months. In between wine tasting, there are a number of restaurants to stop in for a quick lunch break. We grabbed a quick bite to eat at the European Country cuisine themed La Bicyclette. Also, be sure to head down to the long, wide white sand beach where you can view the gorgeous California coastline, with Pt. Lobos to the south and Pebble Beach to the north. Even better, this beach is both dog-friendly and alcohol-friendly. If you want to jump in the car there are two local half-day trips that I suggest. Stretch your legs and take in the scenery at Garland Ranch Regional Park, approximately twenty minutes away. This 4,462-acre park has trails for all levels, from easy to strenuous. We took the 1.4 mile Lupine Loop that borders the Carmel River and was full of wildflowers in bloom. After a good hike, as you are heading back to Carmel, about five minutes from Garland Park, stop at Folktale Winery for a wine tasting and live music. Folktale is a new winery that opened in August 2015 in the site that was formerly Chateau Julian. Situated on fifteen acres of sustainably-farmed vineyards and gardens, there are five-and-a-half acres of vineyards planted primarily just to sangiovese. Folktale has a wine garden, a greenhouse and a gallery that features local artists. As you walk-in, you will be greeted with a glass of sparkling wine and on weekends there is live music in the garden from 4:30-7:30pm. The winery is also dog-friendly, offering bones upon arrival, and kid-friendly with games (corn hole, giant connect four, giant jenga) for them to play and natural juice from sangiovese grapes for them to drink. Head north approximately thirty-five minutes to Moss Landing for the Elkhorn Slough Safari Tour. Elkhorn Slough is one of California’s largest wetlands. The boat will slowly and steadily make its way through the calm waters and you will see sea otters, harbor seals, sea lions and hundreds of species of birds. It is a calm, peaceful and educational way to spend two hours. Ten minutes on your way back to Carmel, you will pass through Castroville, the artichoke capital of the world. Stop for lunch at Pezzini Farms, a local farm that has been in business since 1929. Just next to the open market is The Choke Coach where you can get artichokes any way – fried, grilled and steamed. As I love artichokes, we ordered one of each! After a long day of wine tasting, a good meal is in order and you do not have to go far. In the heart of Carmel-by-the-Sea is the Italian restaurant Il Tegamino. Owned by brothers Giuseppe and Salvatore Panzuto, the name of the restaurant comes from a small pan with a handle (tegamino) which their mother collected. Raised in Napoli, Italy, Giuseppe worked in restaurants in New York and at the Ritz-Carlton Laguna Niguel before running restaurants in Carmel and Monterey while Salvatore worked at L’Opera in Long Beach, Il Cielo in Beverly Hills and most recently Sierra Mar at Post Ranch Inn. When their mother passed away a few years ago, they decided that they wanted to work together and this restaurant is their homage to her. Offering food they grew up with, the menu features local ingredients. One of the highlights is the Polpette Bar (meatball bar). For $24, you can sample all of the meatballs – beef meatball, pork meatball, tuna seafood ball, crab seafood ball, cauliflower meatless ball and mushroom meatless ball. Another special dish is under the Contorni (side dishes) and it is the Pane & Zucchine Alla Scapece. This fried zucchini with balsamic, extra virgin olive oil, mint and red pepper flakes and served with bread is a recipe that their mom always had in the house when guests came over. If you are willing to hop in the car to drive to dinner, there are two other restaurants that I highly recommend. Twenty minutes north, in Pacific Grove is Jeninni Kitchen + Wine Bar offering a Mediterranean-inspired menu with an emphasis on southern Spain. Jeninni also offers an exciting wine list that features many wines from Spain, France and Italy, as well as local wines, by the glass. Just ten minutes north in downtown Monterey is Restaurant 1833, located in a historic two story adobe with a storied past. After being built in 1833, it was sold to James Stokes, a British sailor who jumped ship, passed himself as a doctor, and opened a pharmacy. It was later a home to many others, including a woman named Hattie who died there in 1948 and is said to still be present in the upstairs dining room. Despite the potential haunting, the restaurant is warm and intimate with dining areas set up in the various rooms in the house. The menu features locally-source ingredients and a wood-oven for the fresh breads and pizzas. Be sure to start your meal with the guajillo chili crusted baby back pork ribs that are wrapped in feuilles de brick and served with nuoc mam cham. So whether you are looking for a romantic getaway or a fun time with friends, Carmel-by-the-Sea is the answer. Passports are available at various hotels or at the Chamber of Commerce visitor center. From Carmel-by-the-Sea, take Highway 1 and head east on Carmel Valley Road for 8.6 miles. The main entrance will be on your right. Trail maps can be picked up at the Visitors Center, just over the bridge to the left. Read about each region and the complete story at Thrillist. What are thoughts conjured up when one thinks of Lodi — hot climate, high-alcohol wines, mass production and large brands? Yes, these descriptors can be used, but it is time to rethink Lodi. 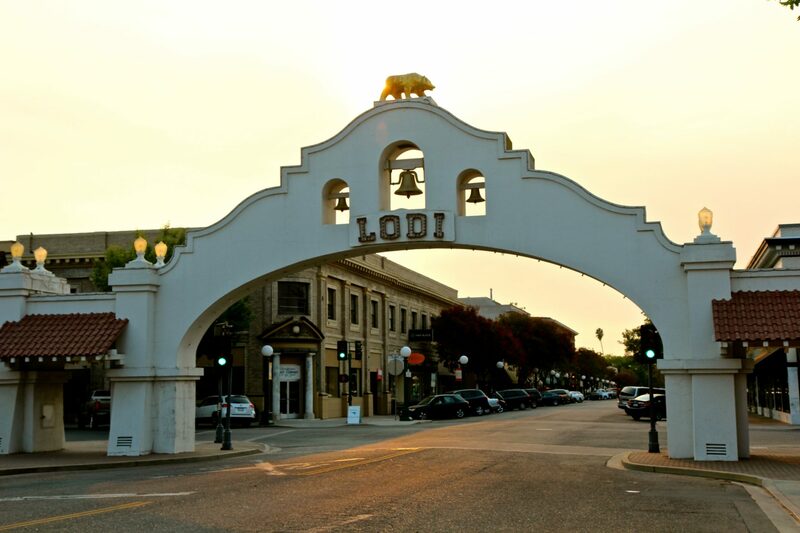 Located about 85 miles east-northeast of San Francisco and just south of Sacramento, Lodi is a significant place in California. Lodi produces 24 percent of the annual crop in California. There are 110,000 acres of wine grapes, farmed by 750 growers (out of a total of 500,000-plus in California). They are the leading grower of chardonnay, sauvignon blanc, cabernet sauvignon, merlot, zinfandel and petite sirah. And since Prohibition, Lodi, located along the train route into the rest of the United States, has been selling 85 percent of the grapes grown to many wineries, including E&J Gallo, Constellation, Fetzer Vineyards, Delicato, Napa Ridge, Ravenswood and Beringer. Growing grapes for 150 years, Lodi is one of the few regions in the world that did not suffer from phylloxera, which destroyed most of the world’s vineyards at the end of the 19th century. Through geological events and alluvial waters, the two major rivers (Mokelumne and Cosumnes) originating in Sierra Nevada, bring soils rich in granite-based minerals and sandy loam. These porous soils are inhospitable to phylloxera, and more than 5,000 acres of Lodi vines still grow on their own root stocks. In Lodi, old vine means old vine, with many vines as old as 65-70 years old. Lodi has a Mediterranean climate. The growing season is sunny and warm, hitting highs of 90 degrees followed by “delta breezes” in the afternoon. Temperatures drop at night with lows of 56 degrees. Rain, as we in California know, is rare and humidity levels are low. Lodi was designated an AVA in 1986, and since 2005, there are seven sub-appellations. Lodi was not a tourist destination in the 1990s but now it is. At the current time there are 65 tasting rooms, and one boutique winery had 25,000 visitors in one year.